Once again, anyone expecting malware related activity at this point will be disappointed: the click then took you to a run-of-the-mill DHL impersonating website where the victim would have entered their credentials… in practice, these sites often collect email addresses and email passwords, so they’re often more of an attack on mail providers rather than DHL. So why is the criminal using this complex method ? The answer lies in the way that email filtering works. 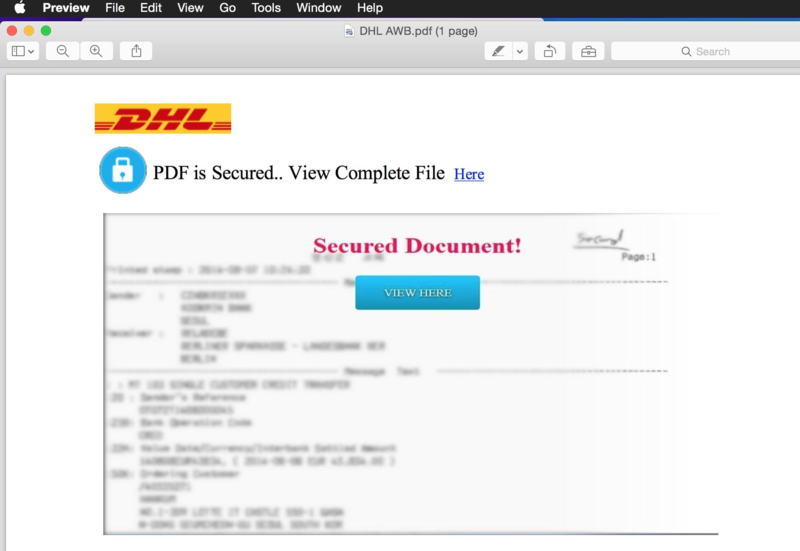 At present, the most that an email handling company will do with this email is to check that the PDF is well-formed and doesn’t contain known-malicious constructs (and the least is that it will be ignored altogether and passed through). 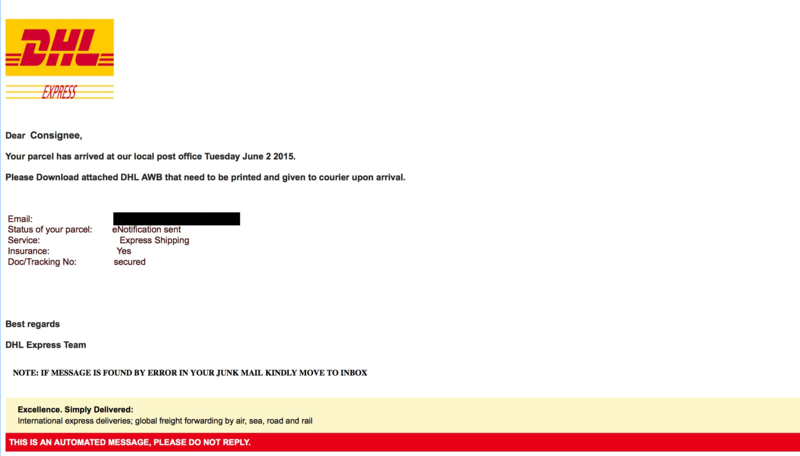 So the presence of the URL will not be detected and the email will be delivered. Of course blacklisting the phishing site might cause the browser (or a toolbar) to throw up a warning to the user — but at a pretty late stage in the process when many will have pretty much made up their mind to view the “secure document” no matter what (recall my recent post about the high percentage of people who clicked through a Microsoft warning). It should also be noted, in case there was any doubt as to whether the criminal really understands how modern email filtering works, that the email contains some advice about moving the email from the spam folder…. this will make no difference as to whether the attachment can be opened on any system I know of — but it will send a signal to the machine learning system that is dealing with incoming email. That signal is “oops you made an error” and as a result the criminal hopes that more of their email will be delivered to the inbox in the future. Outlook (at least in some configurations) doesn’t allow attachments to be opened and doesn’t load external images for items that are in the spam folder. They must first be moved to the Inbox before potentially dangerous content will be loaded. I just wish people could be taught to be even a little analytical when receiving this sort of email. The recipient of a delivery MUST have a valid email address AND be forced to go to the trouble of printing out something before a delivery from someone else can be made?